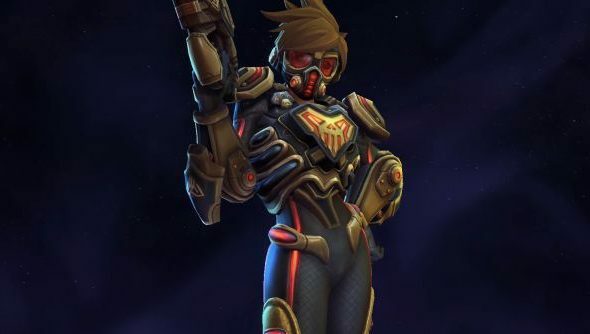 Teleporting, sprinting, dual-pistols-firing, accent-wielding Overwatch poster child Tracer is coming to Heroes of the Storm – and sooner than you might have thought. Heroes players will actually get a shot at her before most have a chance in her main game, with her releasing on April 19 for those that pre-order the Origins Edition of Overwatch, April 26 for anyone else who wishes to buy her separately. Blizzard also revealed some new footage of her in action in their MOBA, as well as details on how her abilities work. Get the lowdown on Tracer in her original form with our Overwatch hero guide. You can see Tracer in action in her new trailer, which also shows off her unbelievably badass StarCraft-inspired skin. Don’t think I’ve ever wanted a cosmetic in a videogame more, at least until Riot make that Lissandra Elesh Norn skin everyone but the lawyers want. Will this now cross-pollinate to become an Overwatch skin? Is that how this works? A complex web of interconnected art assets and story ideas? Put my vote down for “yes, please” anyway. On the non-cosmetic side, Tracer’s big selling point is being able to shoot while moving, a first for Heroes of the Storm and not exactly common in the RTS-inspired world of MOBAs in general. She retains her endless teleporting and repositioning, as well as having an ultimate ability that must be picked – versus most heroes having two options – but can be customised in three different ways. To get access to her ASAP – as well as a couple of days headstart for you and a friend in the upcoming Overwatch open beta on May 3 – you’ll need to pre-order the Overwatch Origins Edition on Battle.net. Otherwise she’ll be released as a normal hero on April 26, available to buy in the HotS in-game store. While we’re here, the HotS Spring Championship took place at the weekend in Korea. The Grand Finals opening ceremony is one of the most ostentatious and fantastically ridiculous eSports things I’ve ever seen. Take a look at it on Twitch. I think my favourite bit is the mostly unexplained robo-arms and the immense cost of the screens they’re displayed on that are now pointing up into the ceiling and will never be seen by the audience again. Well done, everyone.